How to book Test Date and Time for BITSAT 2018? (How to register? 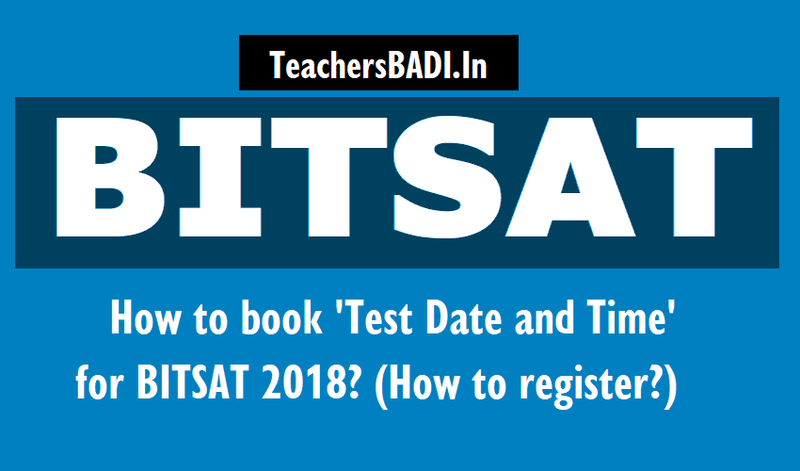 ): BITSAT 2018 Online Slot Booking Begins, Book Test Date /Time Before 5th April, 2018. BITSAT 2018 Centre Allotment and Slot Booking process has been initiated by Birla Institute of Technology and Science, Pilani for the candidates who had successfully registered themselves for BITS Admission Test BITSAT 2018. The varsity has released the exam centres allotted to applicants and applicants will be able to book their test date and slot online now. ‘BITSAT-2018 Slot booking is now enabled. Registered candidates may reserve the test date and slot on a First Come First Serve basis.’ read the official notification. Candidates who had applied for BITSAT 2018 can follow the instructions below and book their slot at the earliest on or before 5th April 2018. BITSAT Slot Booking 2018 begins: Step-by-step guide to apply for BITS Pilani admission. The Birla Institute of Technology and Science, Pilani has initiated the BITSAT 2018 Centre Allotment and Slot Booking process. Registered candidates may reserve the test date and slot on a first come first serve basis. How to book Test Date and Time for BITSAT 2018? Candidates who have registered for BITSAT- 2018 should reserve their Test date and time before 5:00 PM on April 5, 2018. Requests for change of test centers will not be entertained. Further, once the candidate reserves a date and time, no changes are allowed. * B.E. - Chemical, Civil, Computer Science, Electrical and Electronics, Electronics & Instrumentation, Mechanical, Manufacturing. * B.E. - Chemical, Computer Science, Electronics & Communication, Electrical and Electronics, Electronics & Instrumentation, Mechanical. * M.Sc. - Biological Sciences, Chemistry, Economics, Mathematics, Physics. * B.E. - Chemical, Civil, Computer Science, Electronics & Communication, Electrical and Electronics, Electronics & Instrumentation, Mechanical, Manufacturing. For admission to all the above programmes except B.Pharm: Candidates should have passed the 12th examination of 10+2 system from a recognised central or state board or its equivalent with Physics, Chemistry, and Mathematics and adequate proficiency in English. For admission to B Pharm: Candidates should have passed the 12th examination of 10+2 system from a recognised central or state board or its equivalent with Physics, Chemistry, and Biology and adequate proficiency in English. However candidates with PCM may also apply for Pharmacy program. Important note: Only Students who are appearing for 12th examination in 2018 or who have passed 12th examination in 2017 are eligible to appear in the BITSAT-2018 test. Candidates should keep in mind the fact that there is negative marking for wrong answers. BITSAT-2018 Test Format: BITSAT-2018 will be of total 3-hour duration (without break). The test consists of four parts: Part I: Physics, Part II: Chemistry, Part III : English Proficiency and Logical Reasoning, Part IV: Mathematics or Biology (For B.Pharm candidates).